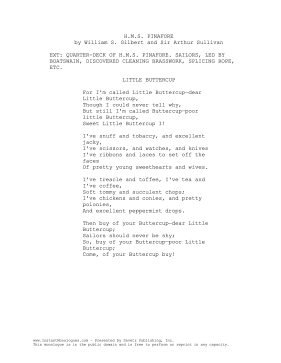 Perfect for musical auditions, this child monologue is a song from the Gilbert and Sullivan play, H.M.S. Pinafore. EXT: QUARTER-DECK OF H.M.S. PINAFORE. SAILORS, LED BY BOATSWAIN, DISCOVERED CLEANING BRASSWORK, SPLICING ROPE, ETC.